Manage your stock more efficiently through Jarmany’s stock & sales analysis tool providing smart views on your stock to help you make efficient decisions on allocation. There are a number of challenges in managing your inventory and ensuring that you have the right stock levels in the right locations which can ensure that sales opportunities are not missed. 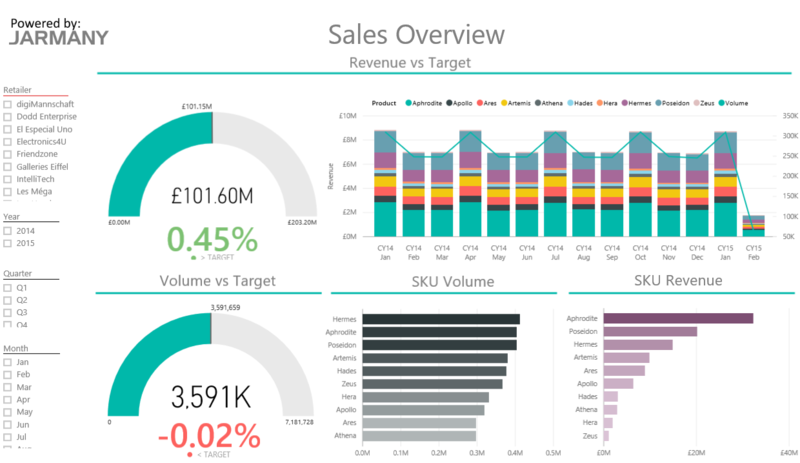 Power BI has the ability to bring your data to life to find the answers to the questions that you are looking for. 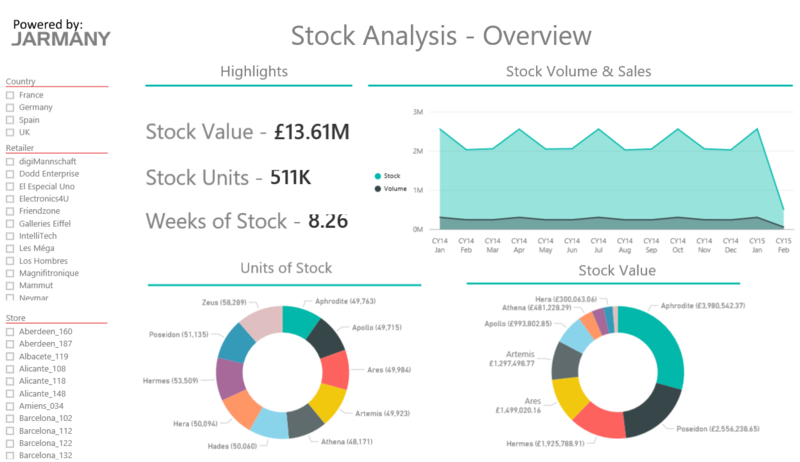 Jarmany are experts in implementing Power BI solutions creating management reports, containing the key insights you need, to answer specific business questions and sell in internally. The result? Better, more informed decisions made faster. Jarmany's Stock & Sales showcase demo dashboard demonstrates how easy it is to track your company's inventory across a country, retailer, store and SKU level providing you with the greatest opportunity to ensure that your stock is in the right place at the right time to maximise on your most successful lines. 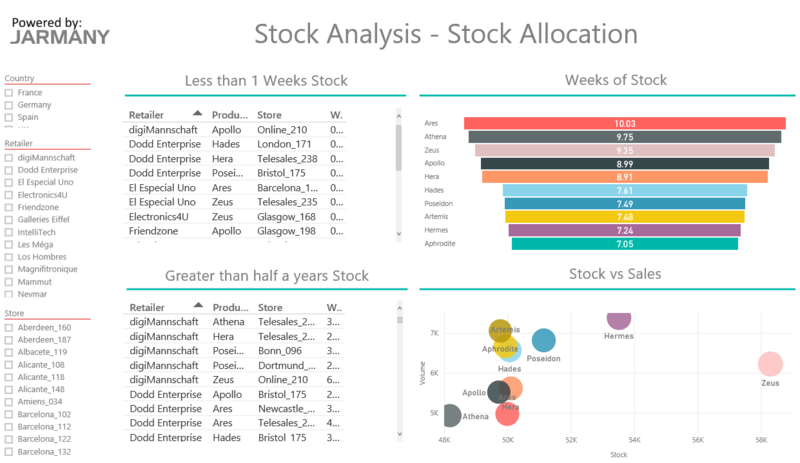 Using the tools available in Power BI gone are the times spent searching for correlations between stock and sales, understanding the number of week’s stock available and the value of inventory in your network. What this means is that you are able to make smarter decisions quicker using Power BI's ability to have live data refreshes available meaning you are able to react to changes in the ever changing landscape as they are happening. All of the above and more is delivered in a rich, clear visual format transforming complex and hard to interpret data sets into actionable insights available to across a number of platforms. Our ethos is one of close partnership with our clients. We like to add value at every stage to help them understand what data and information their organisation needs and how they can make sure it drives change. 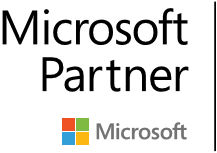 We spend time understanding your needs, strategy and goals and ensure that the Power BI solution helps you work towards achieving this.